The Xebia TechLab has a new friend: FarmBot. Next to 3D-printers, VR installations and IoT devices he will feel really at home. 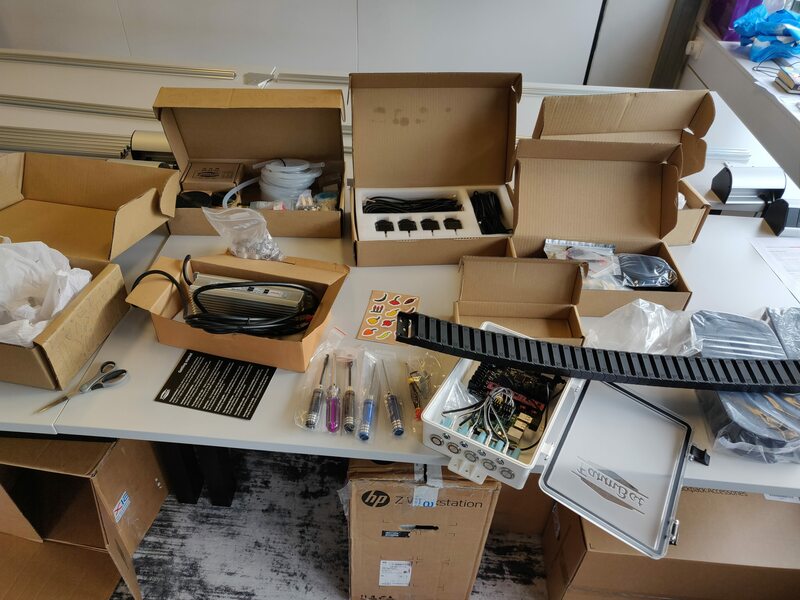 Last week the FarmBot Genesis Kit finally arrived, so we got started building! In this blog post we give a first impression of the project. Next posts we will keep you up to date on all juicy details and experiments. At first we where happy to feel that the two boxes where quite heavy. This hinted that all the ingredients are made of durable materials instead of cheap plastic. It took some time to open all the boxes, which made us smile like a little kid that got a large LEGO box for its birthday. All parts are categorized in smaller boxes. Even drivers/wrenches and an SD card are shipped with the package. It was a little naive that we read the documentation for the first time after the shipment arrived. If we prepared better, we would have known that you can start building the farm bed before building the robot. We are planning to create a movable raised bed so that our FarmBot functions as a mobile garden. This gives us even more freedom in gardening than just having a static garden with a robot on top. Documentation describes something with 4 wooden bars, but that is kind of lousy in our opinion. We want Quality Without Compromise, which means that we are going to build a stainless steel raised bed. The bed will contain 8 separate dismountable 75 x 75cm bins containing the soil and plants. We will elaborate more on this in a future blog post. Ok, let’s talk about our first building experience. First we were very impressed by the documentations. The descriptions and images are very detailed, including information that you would never see in a regular IKEA box, such as volume and mass of one single part. We encountered some documentation errors, which are easily fixed using a Readme.io account. We were less impressed by our own skills. Regularly we tried to work ahead of the docs but then we missed some essential construction details, resulting in reverting some of the work done :). After some hours we managed to finish the tracks and two gantry legs. The tracks should be mounted on the bed, but we don’t have one yet. The gantry legs then should be connected which will be connected using the y-axis extrusion. 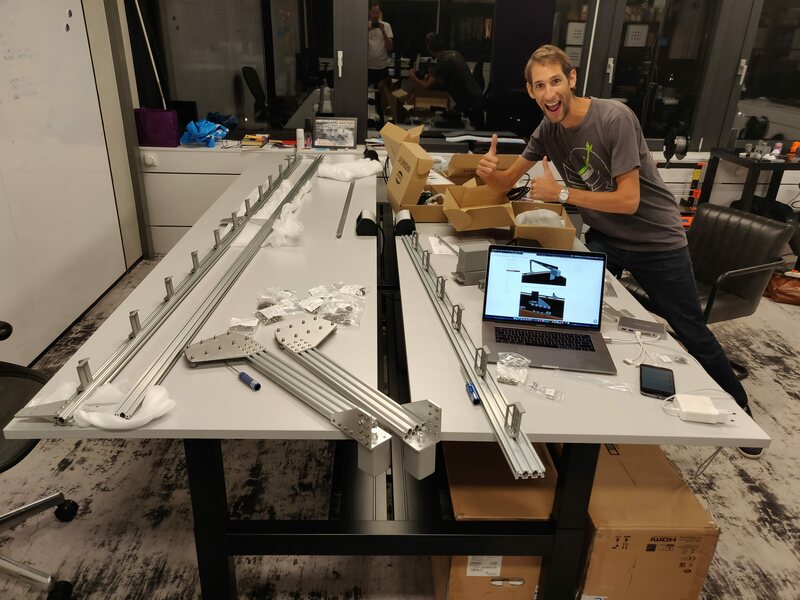 So in fact we are building the robot step by step, but some parts will not be connected before the bed is finished. 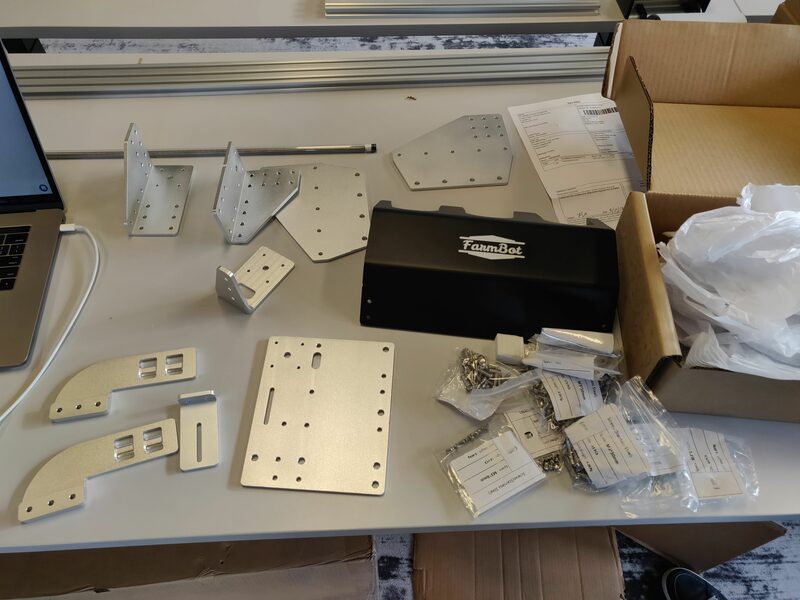 I looks like our metal worker is only available in 8 weeks, so we will use the coming time to finish constructing the larger hardware parts and get started with the software.